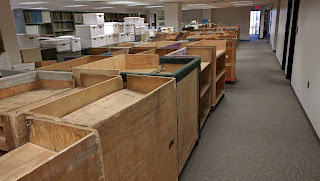 We will be packing the AZGS Phoenix office library and files starting Monday to move them into storage at the old mining and mineral museum near the Capitol. Volunteers will be coming in throughout the week to help pull volumes off shelves into rolling gondolas. Professional movers will transport those and the shelving to the museum, where we will have two weeks to unload them onto the shelves. The extensive historical mining files are being moved intact in their file cabinets. The materials will not be publicly accessible until and unless we can get the museum re-opened. The AZGS Phoenix branch office is being closed as a consequence of our transfer to the University of Arizona as part of Gov. Ducey's consolidation of state government. The State is not providing any support for the move, and with it being the end of the fiscal year, we have limited funds left to pay for it. We have an even more expensive unfunded move to make with our main Tucson office. Fortunately, the volunteers from the mineral collecting and geological communities are rallying to provide assistance in order to preserve these important resources. The vast files we inherited from the Dept. of Mines & Mineral Resources when it was merged with is, are part of the Phoenix materials being moved into storage. As word spreads, of the imminent closure, there has been a rush of clients to make copies of key reports before they go into storage.